Exploring Cambodia: Touring the temples of Angkor Wat, and searching the secrets of Siem Reap. Cruising in faraway destinations such as Southeast Asia encourages consideration to pre- and post-cruise options. These opening acts and encores to the main event range from basic hotel stays to more spectacular, engaging adventures. In compiling a high profile destination bucket list, there are specific components that would be considered obligatory. The Taj Mahal, the Great Pyramids, and cities like Rome and Athens are generally assumed to be A-list destinations. Some lesser-known historical sites may be considered optional, but to ignore the temple complex of Angkor Wat in Cambodia would be a misfortune. Although Angkor Wat is the dominating temple of the area, it is only one out of hundreds of temples, shrines, and tombs spread over 400 square miles. 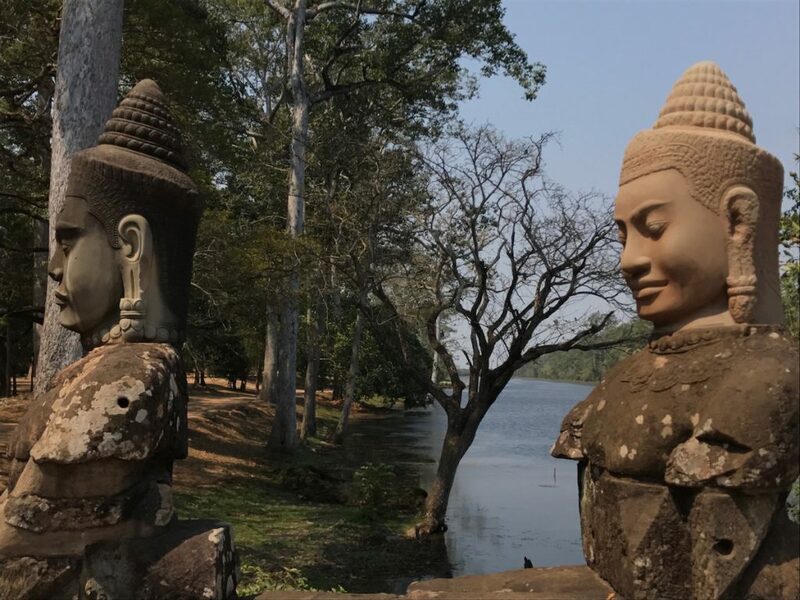 I generally gravitate towards DIY sightseeing and avoid large group tours, however choosing to experience this UNESCO World Heritage site with a private guide from Siem Reap Tour Guides (siemreaptourguides.com) proved to be an extremely rewarding choice. Due to the sprawl and scope of the temple complex, it would be futile to attempt a self-guided tour. This is the largest religious monument in the world and is rapidly ascending to the top of must-see lists. Construction began as far back as the 12th century and was originally conceived as a Hindu temple, gradually transforming into a Buddhist temple. The logistics of such an operation are mind blowing, consuming the labor of thousands. According to inscriptions, the construction of Angkor Wat involved 300,000 workers and 6,000 elephants. Establishing itself as such a fascinating site comes with the baggage of tourist crowds, but using a private guide offers the advantage of secret entrances, remote temples and the knowledge of when to visit specific temples to avoid the crowds. High season runs from September to January and although the heat rises considerably in off-season, prices and lower tourist density is well worth it. Several river cruise companies include Siem Reap as a port of call, but in the dry season, river navigation becomes a problem, so it may be necessary to add this destination as a pre- or post-option. Whatever plans you make, be sure to include a minimum of two or three nights in Siem Reap. Whether you're a first-time cruiser or a veteran sailor of the seas, Porthole Cruise Magazine is your ultimate cruise guide - answering your questions, enticing your senses, and unlocking the explorer in you.